When I passed by this baby bok choy at the grocery store I suddenly had a thought of how they might taste if stuffed like cabbage rolls. They went into my cart and we were not disappointed. Cook onion and sweet pepper until soft, then add garlic. Add tomato cocktail, soy sauce and broth and bring to boil. Thicken with flour by shaking flour and 1/2 cup water before adding to sauce. Simmer 10 minutes. In the meantime, open up bok choy babies and fill with prepared meat stuffing. Lay or stand up in small roaster and cover with sauce. Bake at 350 F for 1 1/2 hours. 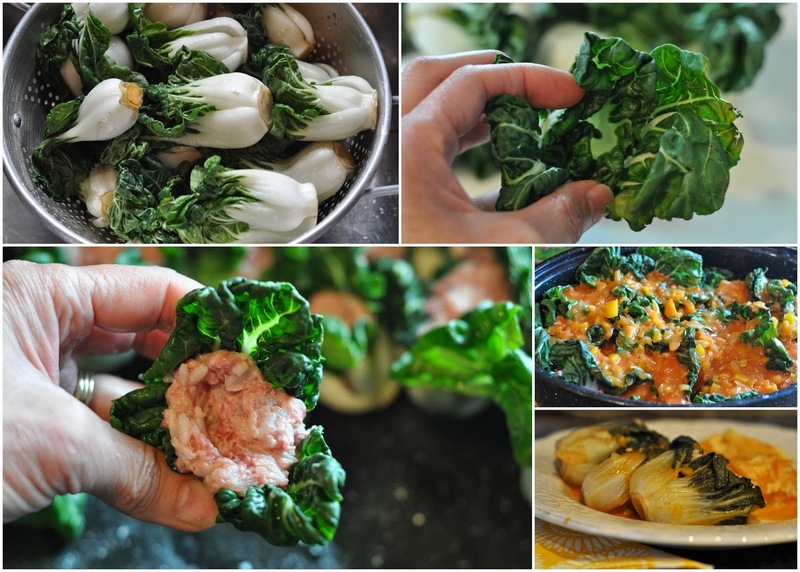 Halfway through, gently turn stuffed bok choy so that more of the top gets covered with the sauce. We had the first go with mashed potatoes and the left overs with a Waldorf salad and a roll. Tasted even better the second round. Anneliese, What a BRILLIANT idea! Love it... will definitely need to try this when I find some baby bok choy. I can only imagine the endless possibilities for the stuffing... even a vegetarian filling will be wonderful:). Oh, and maybe a seafood mix similar to the steamed shumai dumplings:). Thanks for sharing! I love baby bok choy. I buy it at the Asian market all the time. I'm so doing this! Thanks! That looks like a great idea. I never think to buy bok choy.